There is an unreservedly important but often ignored quality that you should always look for in your clients. It is called ambition. Boldness is another way of putting it. Many executives simply want to do a “good job” while maintaining the status quo. Usually, but not always, they are not very satisfying clients. You will have lots of good ideas and proposals for these clients, but you will often be disappointed by their unwillingness to make even small changes, let alone bold moves. It can be exhilarating, on the other hand, to work with an ambitious, bold client. They want to hear all the good ideas you can provide. They are impatient to improve their business. Having a strong bias for action, they compress the time between setting strategy and implementing it. You feel a sense of accomplishment, because your work is having a tangible, positive impact. Ambition, however, is usually tempered by Tenure. Executives who are new in their roles are often more open to advice, new ideas, and fresh ways of doing things. Executives at the end of their tenure, however, are often less open to outside advice and less willing to take new risks. This is especially true as they approach the end of their careers—a frequent phenomenon these days as many Baby-Boomers reach their mid-sixties. Remember, the midpoint group of the 77-million strong baby-boomer generation just turned 64. Be explicit about the risks you see, and point out steps they can take to minimize the downside of new strategies and changes in the organization. Make appeals to their legacy—what mark do they want to leave? These executives know what they want, even if they are not sure how to get there. Don’t be overly directive—rather, share the specifics of how the best companies and organizations have accomplished similar goals. Your client will quickly decide and ask you to help them move forward. Invest to develop ideas for them. In every conversation, you should be sharing one or two new ideas or perspectives on things they can do to move even faster and more effectively. Discuss their legacy with them. What do they think will ensure their impact is enduring? Help them with ideas on how to solidify the positive impact they have had. This could mean coaching and developing the next generation of leaders; implementing systems and processes that will help institutionalize the new practices; and so on. Be curious about what’s next for them and be a sounding board if appropriate. What else do they want to accomplish? What do they have a real passion for? 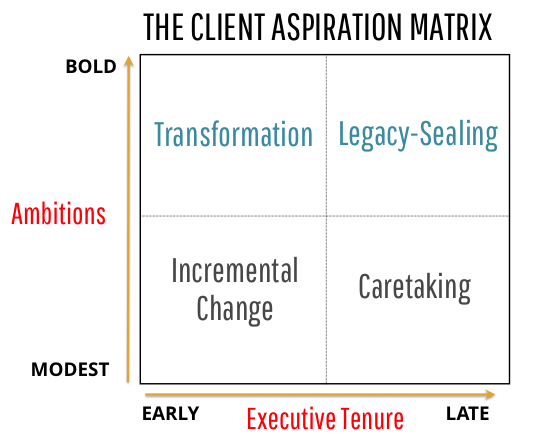 Reflect on your own clients—or for that matter, your boss or a colleague who may fit into one of these four quadrants. Where are they in this matrix? What does their position tell you about how you can be helpful and add value?